AL-OMAR OIL FIELD BASE, Syria (AP) — Dozens of trucks arrived Tuesday at the outskirts of a besieged enclave held by the Islamic State group in eastern Syria, signaling renewed efforts to evacuate hundreds of civilians trapped in the militants' last patch of territory along the Euphrates River. A spokesman for the U.S.-backed Syrian militia that is spearheading the fight against IS said a military operation aimed at ousting the extremists from the enclave will begin if they don't surrender. Such an operation would take place after separating or evacuating civilians from the militants, estimated to be about 300 combatants, said Mustafa Bali, the spokesman for the Syrian Democratic Forces. Just before sundown Tuesday, more than 40 trucks headed toward Baghouz, the last village where IS militants are trapped with hundreds of civilians. 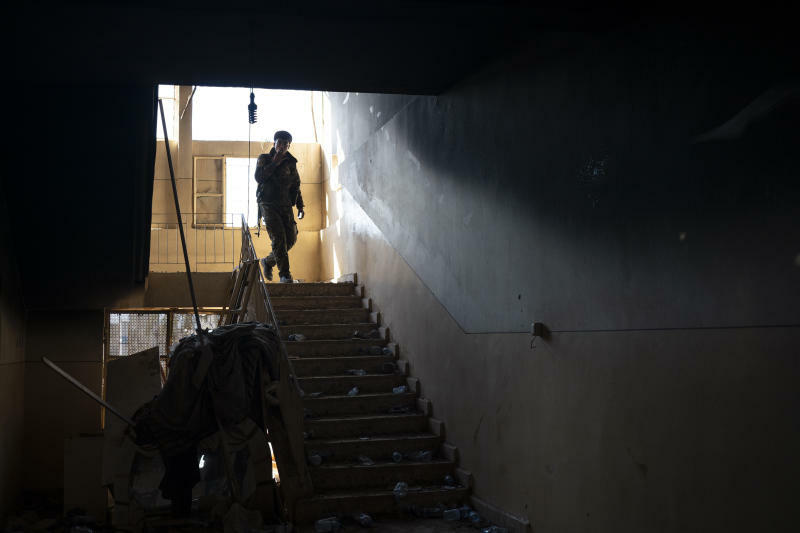 There was no sign of the civilians returning by dark, and on the other edge of the IS-controlled territory, more than one airstrike hit, apparently increasing the pressure on those holding out. 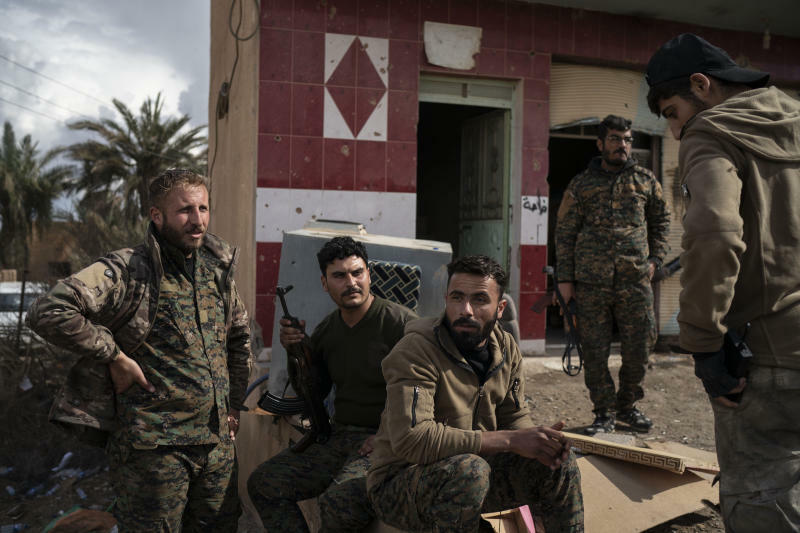 Gunfire echoed over the hills in the distance as soldiers from the SDF waited for the expected evacuation. "We are working on either separating the civilians or evacuating them and raiding the place," Bali told The Associated Press. The Islamic State group has been reduced from its self-proclaimed caliphate that once spread across much of Syria and Iraq at its height in 2014 to a speck of land on the countries' shared border. In that tiny pocket on the banks of the river, the militants are hiding among civilians in the shadow of a small hill, encircled by forces waiting to declare the territorial defeat of the extremist group. Bali's comments signaled an easing of a standoff that has lasted for more than a week. Nearly 20,000 civilians had left the shrinking area in recent weeks before the evacuation halted last week when the militants closed all the roads out of the tiny area. AP journalists saw dozens of trucks moving to the tip of a humanitarian corridor used in past weeks. That corridor had been deserted for the last week after thousands fled through it. About 40 civilians, including a French woman, left the enclave Tuesday morning, apparently after paying smugglers, said a member of the Free Burma Rangers, a volunteer medical group. 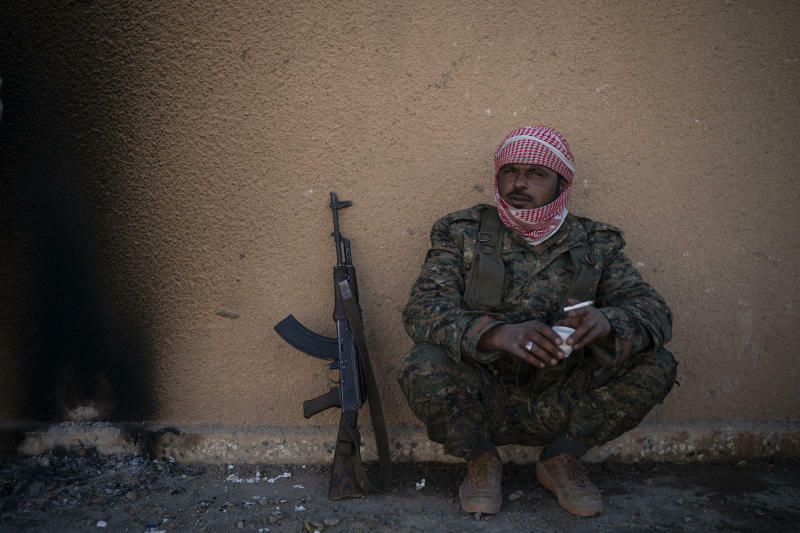 Adnan Afrin, a commander with the SDF, said a number of civilians and some fighters have turned themselves in, and that the trucks went to the corridor to get them. He said those who surrendered included Europeans and Americans. He reported some clashes on the other side of the enclave between SDF fighters and IS militants who want to continue the battle. An SDF commander, Zana Amedi, said his group gave a final warning to the remaining militants to surrender. In a Twitter post, he said most of them are seriously wounded or sick. A U.N. official said she is concerned about the condition of the some 200 families trapped in the enclave. In a statement issued in Geneva, U.N. human rights chief Michelle Bachelet said the extremists are actively preventing civilians, including women and children, from leaving the area. The International Rescue Committee said Monday that more than 60 people have died in recent weeks after making their way out of the IS-controlled area, most of them from exhaustion and malnutrition. They either died along the way or soon after arriving at a massive camp in northern Syria that is hosting those fleeing in eastern Deir el-Zour province. In southern Syria, near the border with Jordan, the Syrian government opened two humanitarian corridors Tuesday with the help of Russian troops for people who want to move from one camp to other parts of the country, the Russian Defense Ministry said. The Rukban camp is home to about 40,000 displaced people who suffer from lack of food and medical supplies. It was not immediately clear if people had started leaving. Last week, the U.N. and the Syrian Arab Red Crescent delivered badly needed humanitarian assistance as Russia offered to help relocate those willing to move to government-held areas in Syria. Jordan closed the border because of security concerns. The Syrian government and its ally, Russia, have blamed U.S. troops stationed nearby for failing to provide security for aid shipments — allegations denied by the Americans. In other fighting, government forces shelled a bakery, killing at least four people, including children, in the town of Khan Sheikhoun in Idlib province, the Observatory said. The Syrian Civil Defense, a government opposition group, said the shells killed five people, including two children, and also wounded five others. It said the bakery was knocked out of service. Associated Press writers Bassem Mroue in Beirut and Jamey Keaten in Geneva contributed.